This month I've been working on my next Talomir Tales army. Ruarigh and I have been trying to add a new army each every game year. My new army is the Tropilium Army based on an early Imperial Roman army. I've added the link to our Talomir Tales blog on the side panel. 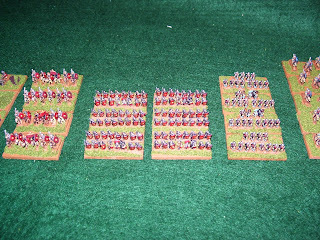 On the right are the auxiliary infantry units, next to them are the light cavalry. This is the heavy boys with the Auxiliary archers on the right, the Legionnaires in the centre and the heavy cavalry on the left. Finally the Scorpion units and slingers. 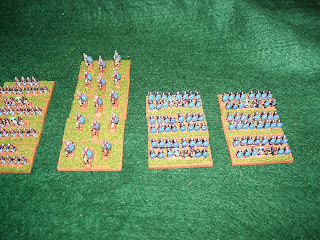 All the figures are Baccus 6mm, mainly from their Early Imperial Roman range. 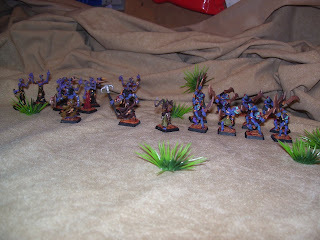 These are the painted Nekharu. I still have about another dozen to finish and buildings to make before the final part of our Searchers campaign can be played. This should hopefully occur before Christmas. The next big project is however going to take a lot of my painting time. Together with a bunch of other fools I have joined in a recreation of the Battle of Towton. I've added a link to the blog on the sidebar. The hope is to do this in as near to 1 figure to 1 participant as possible. It is being done in 6mm, again with Baccus figures, even so the battle had around 70,000 people involved , so it will be large undertaking. We are hoping to take the Battle around several shows in 2011, the 550th anniversary of the battle. We will also be running several of the preceding battles during 2010.